GEOSYS Inc. announced its launch of the GEOSYS Field Profit Planner, a comprehensive tool for farmers and their advisors who pursue high efficiency farming. The new cloud-based GEOSYS Field Profit Planner service gives growers quick analyses of their individual fields while also providing insight into productivity across the entire farm. Unique to the GEOSYS platform, profit analysis for each field is included as part of the standard package. Each grower’s individual field costs and yields can be used to calculate returns on each field or variable rate technology (VRT) field zone. The data is displayed in an easy-to-use format. The service enables better decision making for higher profitability. The tool helps all growers regardless of their previous experience with precision agriculture. Davy pointed out that growers just getting started in high efficiency farming can benefit right from the start: “Our goal with high efficiency farming is to produce more output per unit of input. Whether it be fertilizer, fungicide, seeds or other inputs, we seek to optimize the return.” By refining their management approach using the equipment they have already, growers make more informed decisions resulting in more production per unit of input. He also noted that those growers who have access to VRT make swifter strides with better data and decision-making tools. 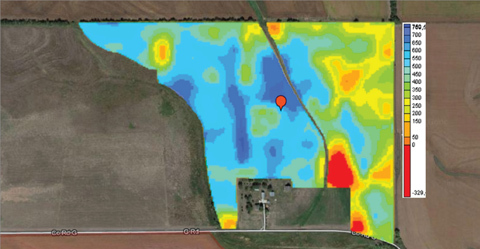 Most growers think about starting the planning process when loading this season’s yield maps. GEOSYS is providing a turnkey solution to streamline the cumbersome process of getting yield maps into a usable framework for making decisions. The new Harvest Map Processor will accept native files from combines, regardless of format, and process that data into the GEOSYS platform. This standardization process reduces the frustration long associated with loading these files.